Hi Nezzie, hi Shanon, hi Carrie, hi Liz, hi Fat, hi Pandancer (sorry, can't remember her name)... did I miss anyone? sorry if I did. I'm here, sorry for... not being here. I need to know who went and saw EMMETT in theatres today! Did you LOVE him?! I'm freaking out because he was on there more than the other two, and he got some EXTREMELY funny lines. Hey EDC! Wow not alot of action happening here, hopefully now that Eclipse is out (in some countries) and it's summer break for some, maybe people will come on more and we will get back into the swing of things. I know everyone will be excited to talk about the movie and hopefully the scenes with our dearest Em but please remember that we do have some members who will have a delay in seeing the movie due to when it premieres in their country or those who might not be able to see it in the first couple of weeks (like myself). I think that out of respect for all our members that we should refrain from going into details about the movie for at least 2 weeks. Now feel free to post your opinions on the movie but PLEASE DON'T go into details about any particular scenes. I'm sorry to be the "downer" on this party but I think it's for the best. I hope that those of you who have seen it, enjoyed it (because I've only heard positive comments so far & that it's the best so far) but I think we need to leave something for those who can't see it in the first couple of days or who don't have it available to them yet, something to look forward too. OK gals, I'm popping in quickly because I knew this issue would arise. Believe me, I'm dying to discuss Emmett in the movie just like you are. But we have a spoiler policy in effect right now - http://forum.twilightlexicon.com/viewto ... =16&t=6202 You can only discuss the movie in the Eclipse movie forum. This is so that anyone that hasn't seen the movie yet doesn't accidentally stumble onto a spoiler. After the 2 weeks I plan to be back here to discuss Emmett with you all and we can talk about all the lovely Emmett moments as well as the things that were missing - without going into any detail I will say there were 2 Emmett moments I was disappointed to not get in the movie and 1 that I think played out better in the movie than in the book. Can't wait to discuss this with you all in a couple of weeks. Emmett (and Kellan) were amazing. that's all I'm saying for now. OMG Guys, going to a late night showing of ECLIPSE tonight... I'm so excited!! I guess you could call that a rant. Im starting to miss emmett... You dont think you could find him and talk him into being on here on monday could ya mom??? Speaking of emmett... I will keep this as spoiler free as possible. But from what ive seen from the featurettes i loves what i saw of him when they were training for the fight. HILARIOUS. hmmm... i have no idea what the question is now so i will make a new one. this was an olderone i saw but i didnt get to awnser it and there were some people i want to see what their awnsers are that didnt awnser. My dad. 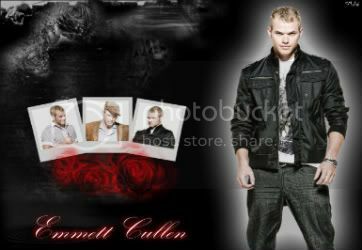 He has that very playfull and cheerful personality like emmett. And when he was younger (and it wasnt grey - ish) he had this real dark, almost black, lightly curly hair. that is how i always pictured emmetts hair. though get him mad, you better stand back. Well its getting late. ive got to go. P.S What happens on the lex stays on the lex. Hi! I'm Shai i'm team Emmet, of course! -What inspired you to join the EDC. Inc? Emmet! Cuz he is the coolest guy, EVER! - What was your first impression of Emmett? - What is your favorite Emmett quality? - What is your favorite Emmett moment and/or quote? I seriously don't know! Every time he opens his mouth it's amazing! - What do you think about the casting of Kellan Lutz as Emmett in the Twilight movie? - Is there anything you would like to submit for potential topics of discussion? -Any last confessions concerning your love for Emmett? Wow. Still not many people are on here. Some very good emmett moments too. willowtree wrote: Emmett (and Kellan) were amazing. well not much more to say really. I have a felling you will fit in very well. umm really no excuse why I haven't been on in forever every once in a while I lurk around but really I have been super busy! Okay haven't got much time so I'll just answer a question and hopefully I'll be on tomorrow yay! Who in your life is most like emmett? Umm I would have to say either my big brother Or my Grandpa. My big brother because I feel like he would do anything for me whether it put him in danger or not I can always count on him. and my Grandpa is so fun and loving and just loves everyone who he talks to and believes in everybody.